_ I don’t necessarily want to present this topic sounding as though it’s a caution, but in some ways it is. My whole career has been focused on the intricacies of the neuro-mechanics of what is often called and known as the subconscious or the unconscious mind. As a teacher and trainer in the field of clinical affectology, I warn my students to be very careful about claiming any real ‘content’ knowledge of the unconscious or non-conscious mind – their clients’ or even their own. There’s a reason that it is called the ‘un’-conscious or the ‘non’-conscious mind, and that is because the details of its content are unknowable. It’s not rocket science to realize that if unconscious content could be defined and drawn to conscious awareness, we would all know everything about what makes our bad habits and drives tick. My practitioner students are bombarded with instructions to treat clients’ subconscious minds with respect and veer well away from claims that content can ever be excavated and known. 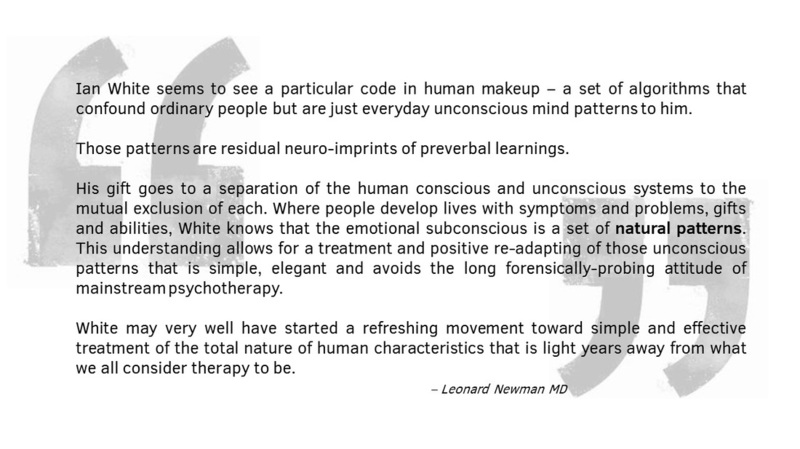 Given that neuroscience and affectology state that the subconscious – the unconscious – the non-conscious (choose one; it doesn’t matter) – can never be authentically known by either self or other, then what’s the purpose of a therapist? And this is a reasonable question, often asked of me in the clinical setting. The answer relates to the huge difference between what we’ll call fact-content and what we’ll call procedural mechanics. New findings in affective neuroscience – and in fact, old philosophy – tell us that it is impossible to have authentic knowledge of the content of the unconscious; that is, episode-memory, habit formation and root cause. But we know without doubt how aspects of the unconscious work and what it is that makes them work in the way they do, often against our apparent interests. So, clearly stated, my clinical work and the content of this program have a specific interest in that ‘how.’ All our investigations here relate to what we have called the procedural mechanics. To put it simply, you have two minds. Our work focuses on that which lies silently beyond the control of your everyday waking conscious ‘knowable’ mind. Popularly, that is called the subconscious (in the interests of some simplicity, let's say we have only two minds, although an appreciation of the layering of multifaceted mind operation is probably a bit beyond us mere mortals to grasp). Undercurrents in your mind? Scary thought? Well, it shouldn’t be, because those very undercurrents are what drive you to be who you are and form ingrained habits of certain mental, emotional, attitudinal and physiological behaviors. Embrace them! The procedural mechanics of those undercurrents are what interest us in our project together here. That saying in psychology that you can’t change that which you don’t know about, don’t acknowledge, makes perfect sense. I often use a metaphor for this and tell clients and students alike, that if the engine of your car has stopped working, you don’t look for the problem in the car’s trunk and under the spare wheel. You must lift the bonnet and investigate the workings of the engine. As banal as that may seem, it is apt, since we live in a world where we are convinced that we can fix all mind things with our logical conscious mind, and more often than not, by fixing the symptom rather than the symptom’s cause. Much of what you read here may be a challenge to you because it doesn’t seem to fit with how our conscious mind processes information and seems to work. And that’s because it is almost entirely about what’s going on at that true unconscious level of the mind’s operation. But we can’t go any further with our project until we make perfectly clear the territory of the ideas, propositions, truths and myths covered in this program. If most of what and who we are were to be controlled by our conscious, willful, logical and ‘smart-thinking’ mind, then there’d be no mood problems, no attitudinal problems, no problems stemming from wrong choices at all in the world. We’d simply think ourselves well, healthy, wealthy, changed and different through an act of logic and will. You would not even be in this program because there would be no problems in your life. We would all simply exert conscious decisions and plans to change our lives for the better and be unaffected by subconscious habitual feelings, emotions and impulses. Right? But we all know that this is not possible. Yet we have, in our society, for the last hundred years or so, been hell-bent on handing over the power of control of our lives to that conscious, willful, logical self. (As a matter of fact, this has been the progression of mankind – or regression, depending on your perspective – for the last two thousand or more years!). Julian Jaynes, in his important book, The Origin of Consciousness in the Breakdown of the Bicameral* Mind, intelligently proposes that we humans have become (over the last couple of millennia) so seduced by the apparent smartness of our ‘problem-solving,’ conscious, rational minds that we have ignored and even come to disrespect our ‘god-run,’ [sic] intuitive, self-healing unconscious mind. The proposal is that instead of developing and progressing over that time, we’ve gone backward when it comes to mental and emotional mind health. We no longer trust our deeper selves, opting to try to think our way out of problems that are caused by unconscious ‘procedural mind mechanics’ and nothing at all to do with the thinking actions of the mind. Peter, a computer programmer who was ready to see me as a client, wrote me this passage after an email discussion about the nature of his upcoming therapy. I think I get what you are saying. Perhaps if I paraphrase the meaning of the metaphors you can confirm my understanding? Our mental lives consist of more than what we are consciously aware of. There is mental activity that occurs below the threshold of conscious awareness. _1 Is not in verbal (word) form. That’s a mouthful, but maybe you can read it again slowly because it is perhaps the most important statement in this whole program, and in fact the most important statement that might be made of any psychotherapy ‘work’ at all. It may not make a lot of sense to you now, but it will not be so difficult once the way has been cleared by shedding light on the fixed but flawed ideas behind the myths of how our minds operate outside the control of our conscious minds. We live in a world fond of metaphors, and there are many varied similes that align the operation of the human mind with computers. The most popular one, fondly favored and used by psychologists, pop-psychologists and lay people alike, is that the mind is like a computer and that it will act on the information that’s put into it. It likens the highly multifaceted and intricate existence of the human brain-mind complex to what is, by comparison, a pretty basic man-made machine. Nevertheless, it’s marginally understandable by us (often) uni-dimensional souls. I’m sure you’ve heard the saying: ‘junk in, junk out.’ And in order for new action to take place, there needs to be new data inserted for re-programming, rather than junk. I’ve never been really comfortable with this metaphor much, because it says very little about the incredible intricacies of the human mind, and perhaps more annoyingly, it discounts the fact that you are far more capable and have a great many more resources within the mind than modern therapy gives you credit for. It also implies that anything worth knowing in order for you to change for the better must come from an external source – the new ‘program.’ And this is simply not so. Computer-metaphor pundits liken the conscious mind to what can be seen on the screen, and the subconscious to what’s going on behind the screen that is not necessarily readily accessed. I think that’s rather simplistic too, even if it seems workable and acceptable because it’s simple. The study of Affective Neuroscience is interested in preverbal education – the things we learn at an age long before we learned to apply language to our experiences. We cannot build ‘stories in our mind’ to explain their content. The procedural mechanics of these early learnings are laid down with an intention to protect us. We look at this more fully in the section ‘The Mind Gremlins’, on another page of this site. So, Affective Neuroscience, affectology, and any practical program based on affectology are interested in the fact that we learned purely through the experience of ‘affect,’ or ‘feeling’ at that time and that those learnings, although open to some degree of plasticity, are still with us into adulthood, albeit in subtle trace form - perseverated and state-dependent. When we use our computers, we mostly utilize a system into which certain programs have been loaded, and we call these the operating systems. They are usually Windows or some such program. Into these operating systems are loaded other complex and sophisticated programs that are accessible through the Windows (or other) programs: programs like Microsoft Word or Office, or whatever the ‘face-operant’ actions between you and your computer might require. Think of this face-operant aspect as being your conscious, knowing and observable self. But all computers* operate using a basic BIOS (Basic Input/Output System) of functioning, largely hidden from the operating system. This is the system that gives the computer ‘life below and beyond,’ or in my terms ‘nuclear life’ (nuclear meaning literally central part, foundation or beginning), and is installed before any other system or program. That BIOS system is not able to be accessed through the auspices of Windows or any other application that is obvious and readily usable by us mere non-technical mortals. The BIOS system is what is called state dependent. That is, that it can only be accessed, much less altered, by using the access language and algorithms that created it. We mortals cannot do that. It requires a certain level of creative (as in it was created this way) knowledge and skill to do so. _*There are exceptions. Some systems operate differently. doesn't use the motherboard's BIOS. _As the computer metaphor rattles around our society with we users thinking in terms of the mind being able to be altered by accessing the computer through our Windows and Word (for example) programs, representing our narrative capabilities, we miss the point that the BIOS system cannot be accessed using these present and accessible tools. The state-dependency of BIOS requires that in order for it to be altered to underpin current ‘life’ of the computer in any different way, it must be accessed via the state that was responsible for its creative writing. If one were to delve deeper into computer science, I think the best metaphor would be that the aspect of the affect unconscious that we are concerned with - the early-developed non-verbal matrix - can be likened to what is technically known as machine code, the hexadecimal binary (1's and 0's) code that can be executed directly by the CPU ... (If you were to open a "machine code" file in a text editor you would see garbage, including unprintable characters - not unlike the non-verbal characteristics of preverbal affect encodings in human beings). In the same way, our preverbal affect (emotion) learnings and the establishment of our sense of ‘feeling’ relationship with ourselves can not be accessed via the use of a completely different experiential way – words. Accessing and allowing for change to be brought about at this very important level must be done through its original formative experiential format – affect: feeling. The intention of this entire program is to help you allow your subconscious to make change at this basic metaphoric BIOS or Machine Code level through discovering that essential data held and encoded by way of belief systems is wrong, simply because it is obsolete. Even though I’ve presented a case for there being a significant part of your mind, the factual content about which you can never know, it can still be exciting territory. As we venture into a tale on the mechanisms of unconscious affect, let me extend to you this passage from Michael Robotham’s novel, Shatter, and …. Welcome to the great unknown! …a piece of human brain the size of a grain of sand contains one hundred thousand neurons, two million axons and one billion synapses all talking to each other. The number of permutations and combinations of activity that are theoretically possible in each of our heads exceeds the number of elementary particles in the universe…….. Welcome to the great unknown. _ But Robotham’s ‘great unknown’ may not be quite as unknown as it first appears. This great unknown can be more known in its manner of operation than you think. Are you really in charge? Are any of us really as in charge of ourselves as we think we are? We’ve already established in other sections of our program that if we were captain of our own ship – in charge of our own mind – then we would always have the right and immediate solutions for any problems in our lives - whether emotional, mental, attitudinal, habitual, executive, success-oriented, performance-oriented - and we would be able to immediately correct those problems. There would be no mental discomfort: no emotional dissonance in our lives; no problems.